Welcome back to another Muse challenge! This week we have a super fun and very pretty striped card from Marion. 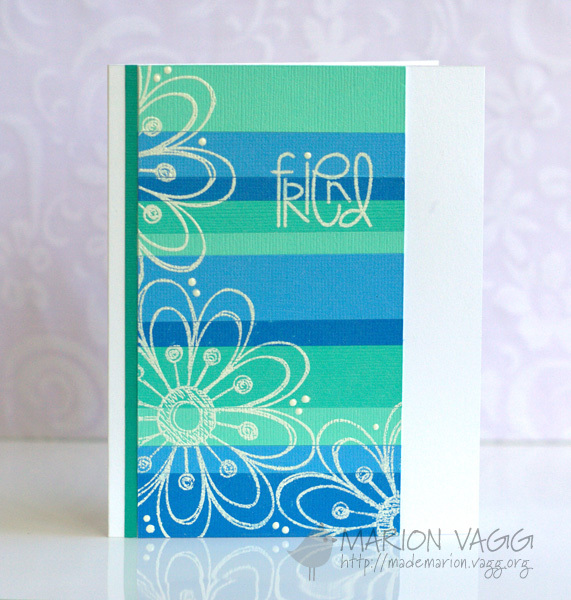 White embossing is such a cool look, especially on variegated colored backgrounds like this! Now here's your Monday Muse, Marion Vagg! Oh I love this card! I've wanted to use some scraps like this, but haven't tried it yet. Thanks for another wonderful inspiration card! Oh my gosh...this card is stunning! Hoping to get to play along again this week...wow! What a lovely card!! Can't wait to play along!! What a lovely inspiration for us - love the colors! Thank you, Jackie and Marion! Another fun MUSE card and the entries are fantastic! !